Springtime and Easter usually means plenty of lemon desserts! 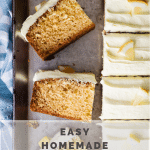 So here’s an easy lemon cake that can be used as a large celebration cake or cut into individual squares. It’s no secret I have a special love for lemon desserts! 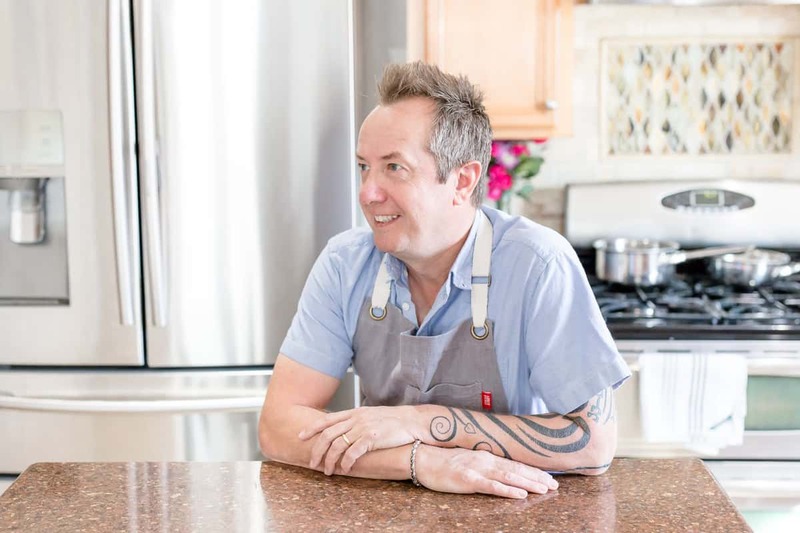 Whether its these lemon bars with fresh rhubarb or an amazing lemon bundt cake with raspberries as long as it has a strong lemon flavor then I’m all in! And it always helps when so many friends have lemon trees in their backyards, for some reason I’ve never thought about planting my own lemon tree but that’ll be changing soon, so that I can make even more epic lemon desserts for everyone! I had high hopes for this lemon cake before I made it because it has sour cream in the recipe, and usually anything baked with sour cream turns out a little more moist than anything I bake with just butter and eggs. In fact the only butter in this recipe is in the lemon buttercream. Making my easy lemon cake. Because there’s no butter in the lemon cake part of the recipe, we skip the creaming of the butter and sugar. To replace this and still maintain a cake batter with tons of volume, so our cake won’t be heavy and dense, we need to whisk the eggs with the rest of the ingredients at high speed. Once this is done and the batter leaves a thick ribbon trail when you let it drip from the whisk, then we can add the dry ingredients. Pour the batter into a prepared cake pan and bake! That’s it, I recommend making the cake the night before you need to serve it. It’ll need to be at rom temperature before you lay that thick lemon buttercream on top. 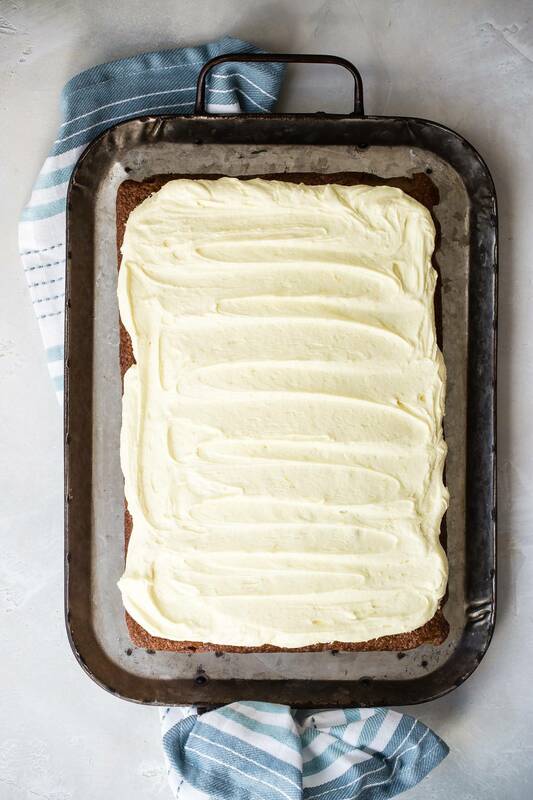 Let the cake cool on your counter top overnight covered loosely with a clean towel. 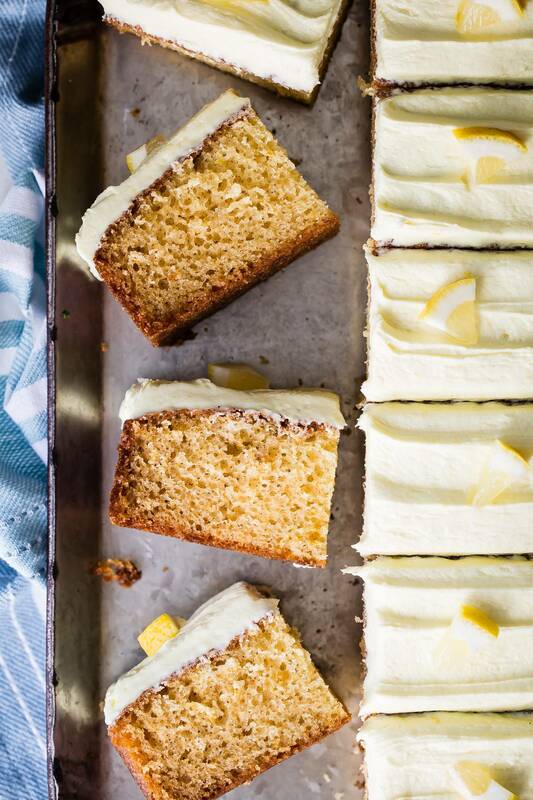 Tips for making this lemon cake. Eggs should be at room temperature before whisking. This will help gain even more volume. Make sure to leave an overhang of parchment paper when you line your 13×9 inch pan. This makes it easy to lift out of the pan. I like to test my cakes for doneness by pushing down gently on top with my finger. If the cake springs back quickly it should be ready, but if it leaves an indentation, then more time is needed. The butter for the buttercream should be at room temperature before beating with the powdered sugar. Sifted powdered sugar will always work out better in the long run, less lumps and lighter. 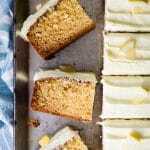 An offset cake knife makes spreading the buttercream much easier than a regular knife or spoon. Store the cake covered at room temperature. If you must refrigerate it, then bring it back to room temp or the buttercream will be hard. 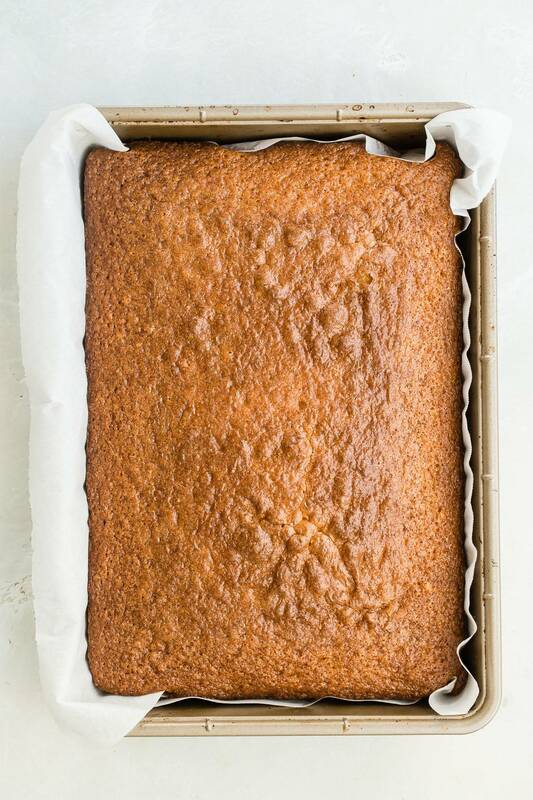 Let me know if you make this easy lemon cake or any other recipe from the blog, I always love to see what you guys are making so tag me on Instagram @foodnessgracious. Check out these other amazing lemon recipes that you might like! 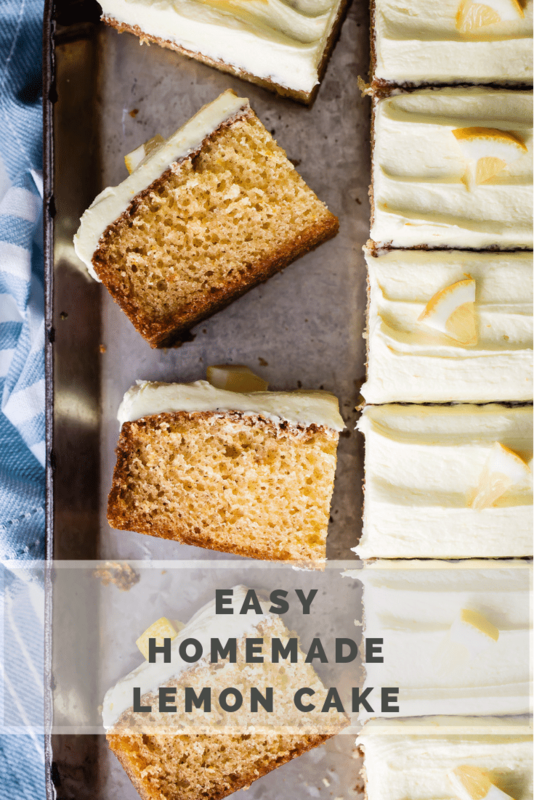 This easy lemon cake is moist and delicious with a thick creamy lemon buttercream on top. Make this for your next birthday celebration or as an easy Easter or spring pot luck item for a party! Preheat the oven to 350 degrees F. Line a 13x9 inch baking pan with parchment paper. In a bowl combine the flour, baking powder and sugar. In the bowl of a stand mixer add the eggs, sour cream, lemon zest, lemon juice and vegetable oil. With a whisk attachment, beat the wet ingredients on medium-high until well combined and it becomes thicker and has more volume, about 5 minutes. Scrape down the sides of the bowl a few times and then add the flour mixture on low, scraping down the bowl a few times. Transfer the cake batter to the pan and evenly spread it out. Place in the oven and bake for 40-45 minutes and then let cool. To make the buttercream, add all of the ingredients to the bowl of the stand mixer and with a whisk attachment beat on low speed until the powdered sugar has been mixed in. Turn the speed up to high and beat until soft and creamy. 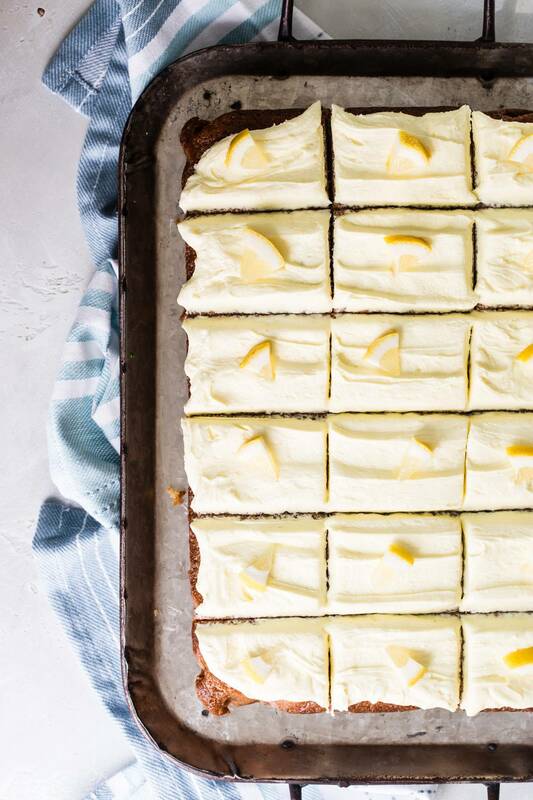 Once the cake is cool, spread the buttercream on top and cut into individual squares.